Places Near Me is a Windows 8 Location Finder. Using Places near Me, you can easily locate the Gasoline stations, ATMs, Banks, Hotels, Coffee Shops, and many other places near you. The app will itself locate your position and on the basis of that, it will find your Places of Interests. Get detailed directions to the place you want to go. Also you can find the directions you have to follow to travel between any two places. You just have to provide the address or just have to click the places on the map given in this Windows 8 Location Finder, and the app will give you the directions you have to follow. 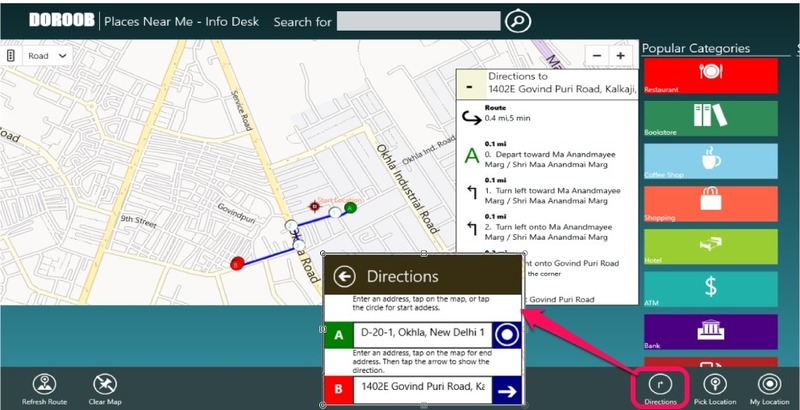 This Windows 8 Location Finder is freely available in the Tools category of the Windows Store. As you launch this Windows 8 Location finder, it will ask whether it can access your location or not. Now, you can enter the location by just providing its name in the search box that is available here. 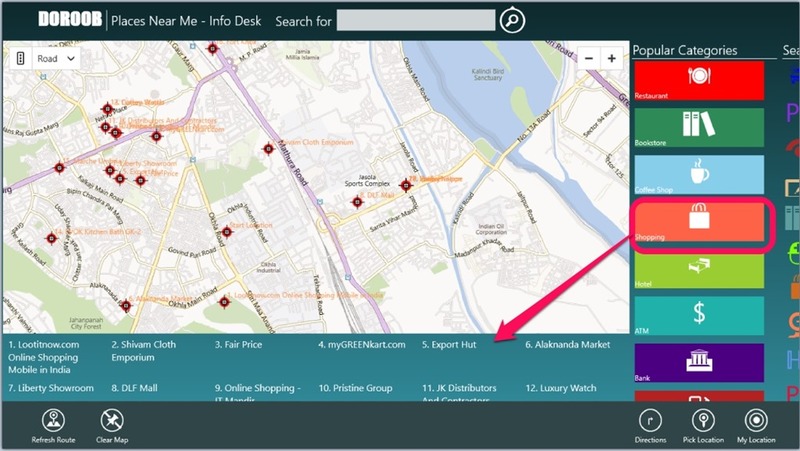 Provide the name for the place and this Windows 8 Location Finder will search all the related places for that location. All the related places will be displayed by the app on the lower side in a panel. Click on any of the founded matches and this Windows 8 Location Finder will locate it on the map that is included. 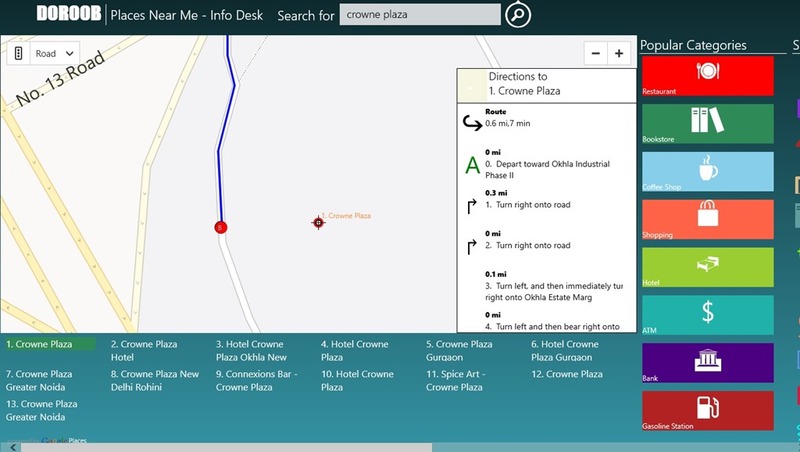 Along with that, this Windows 8 Location Finder also gives you the capability to get directions between any two places . For that, use the Directions option that is present on the bottom flyout. To get the bottom flyout, right click the mouse anywhere on the app. Two initials namely A and B will be shown. In A, by default your location’s address would be present. Just provide the starting address in the A option and specify address for the destination in B, and this Windows 8 Location Finder will show you the location on the map that is present over here along with the directions to reach them. Also what you have to follow to reach the destination would also be shown by this Windows 8 Location Finder in a panel that appears on the right side when you search with it. In addition to all this, if you want some nearby places like ATMs, Restaurants, Bookstores, and others, you may be able to locate them easily by using this Windows 8 Location Finder. 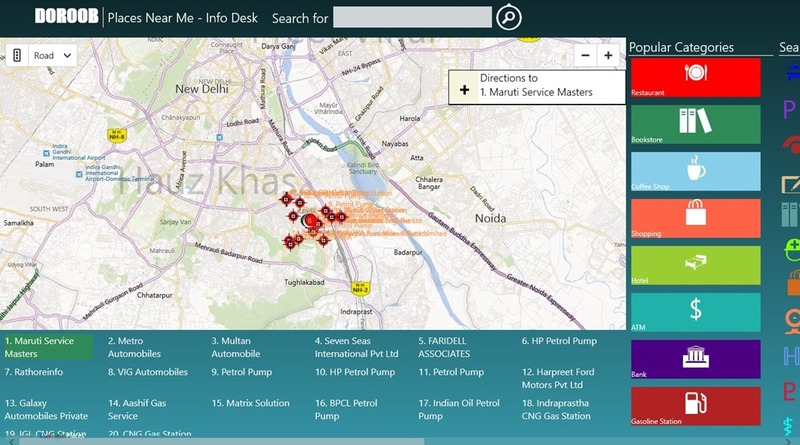 Also check Windows 8 Apps to find ATMs, Win Maps, and Eatfindr. Get Directions to reach from one place to another. Use the maps available in the app. Pick the places from the map or input from the search box of the app to get the directions. Places Near Me is a good Windows 8 Location Finder app. Try it for sure and share your experience with us. Get Places Near Me here.